We are delighted to confirm that the two new-build schemes we have developed in Oldham, Delph Surgery and Hollinwood Medical Practice, have reached practical completion and have been handed over to our clients. 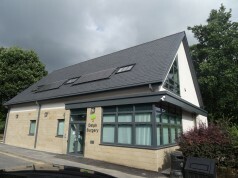 Delph Surgery has been developed by Community 1st Oldham on behalf of Saddleworth Medical Practice and is a two-storey building comprising GP surgeries to the ground floor with staff and ancillary accommodation on the first floor. The new building provides improved facilities for both staff and patients with flexibility built into the design to allow for re-configuring spaces if required in the future, and the ability to use and share space for several purposes. Hollinwood Medical Practice replaces a temporary modular building and was constructed by North and Partners Technical (NPTL) and built for Hope Citadel, a community integrated care service set up to provide NHS primary care services in deprived areas. The centre provides a number of health services to the local community including consult exam rooms and minor procedure rooms on the ground floor with a clinical group room and counselling rooms together with staff and ancillary accommodation on the first floor.